Even though this book is getting scarce, it is still one of the best and most visually appealing books on this subject. There is recipe after recipe for using hundreds of different dried herbs and spices. The instructions are explicit and easy to follow. Ms. Black uses plenty of herbs with variegated scented geranium leaves and yellow and Spanish lavender heads making surprise appearances. The only suggestion is to start at the back of the book. Here is where the instructions for growing, harvesting, drying and storing are. 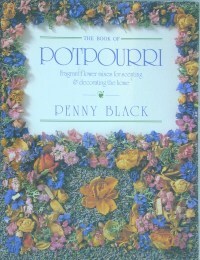 Also, here are the descriptions of the different herbs, flowers and barks and how to use them. Too bad it is not a scratch and sniff book. The jars and bowls and platters and pages of photos are so real you could swear there are rose buds in the air.